Industry has been important to the American economy since the earliest days of our country and the strength of the manufacturing sector is a priority for the US government and members of Congress. In a Senate briefing last week, staff on Capitol Hill attended a presentation celebrating the success of the Industrial Assessment Centers (IAC) program, a little-known and long-standing initiative funded by the US Department of Energy (DOE) that helps small manufacturers save energy while training the next generation of energy efficiency engineers. As part of the IAC program’s 40th anniversary, hill staffers from more than 10 Congressional offices convened for a briefing organized by Senator Jeanne Shaheen (D-NH) to learn about the program’s achievements. Since the program was founded in 1976, teams of students at 24 of the top US engineering schools have conducted more than 17,000 free energy assessments, and helped small and medium-size manufacturers save more than $1 billion in energy costs and enough energy to power over 1.4 million homes. To emphasize these successes, Senator Shaheen and Senator Lamar Alexander (R-TN) submitted a formal recognition resolution commending the value the IAC program has brought to both manufacturers and engineering students. Dr. Kathleen Hogan, Deputy Assistant Secretary for Energy Efficiency for DOE, spoke at the briefing and described the program’s critical role within the department and shared her perspective on how we can ensure that the momentum continues for the next 40 years. IAC Technical Field Manager Dr. Michael Muller from Rutgers University and Dr. Sudhakar Neti, assistant director of the IAC at Lehigh University, also spoke at the event and shared stories about what it is like to work with students in the field. Another speaker, Bert Hill, manager at Volvo Group North America, explained the benefits his company received after IAC energy assessments were completed at five of their plants over the last three years. A study commissioned by the DOE last year evaluated the performance of the program over fifteen years (1997–2013) and confirmed the measurable impact it has had on both energy savings and job skills development. The efficiency recommendations implemented by companies yielded over 480 MBTUs annually for every federal dollar spent, all while developing a pipeline of talented engineers who are trained in energy efficiency with skills that are highly valued in the job market. Several IAC student alumni who graduated from the program and work today as energy efficiency engineers also attended the briefing. The future of the IAC program is bright and DOE is currently reviewing applications from universities to select which ones will host centers for the next five years. Hosting an IAC can have a large impact on a university and the territory that the center serves, so universities compete to host a center and partner with utilities, government, and local manufacturing groups to make compelling proposals. 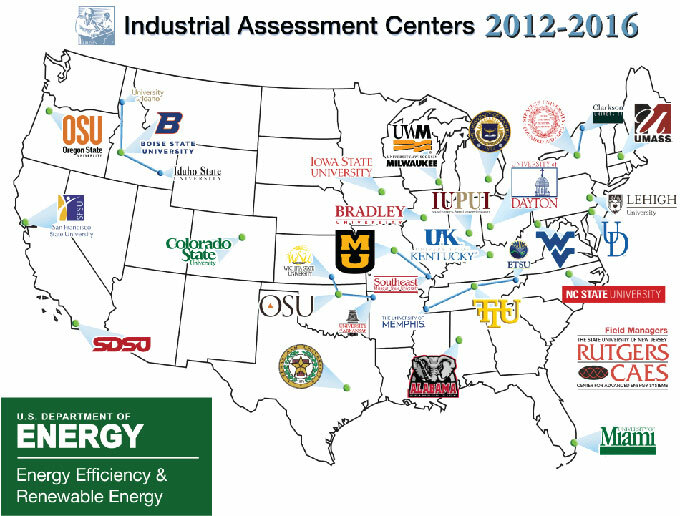 DOE will invest approximately $35 million in those centers over that five-year period.